Enjoy a day at the races with one of the sport's favourite jockeys, courtesy of Frankie Dettori's Magic Seven. It may not have a progressive treat in its nosebag but this five-reel, 25 pay-line runner inspired by the cheery Italian offers a generous fixed jackpot as well as a couple of decent bonus rounds. We’re under starter’s orders! 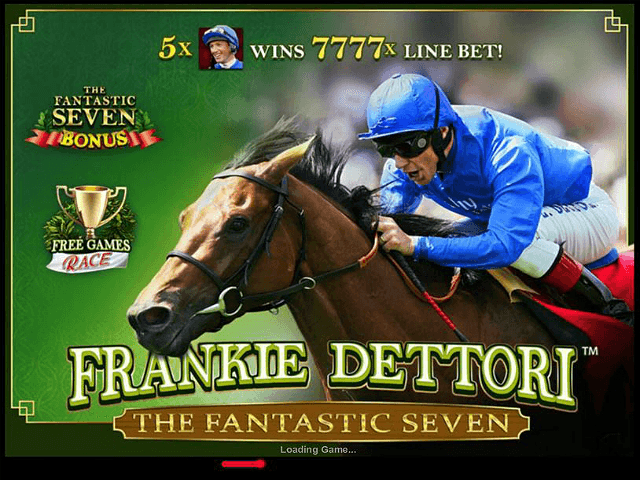 Play Frankie Dettori's Magic Seven Slot Demo for Free! 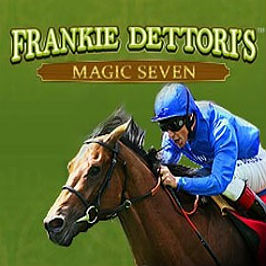 Play Frankie Dettori's Magic Seven for Real Money! 100% Welcome Bonus up to £200 + 20 Extra Spins on Dream Catcher! New players only (first deposit). 100% Deposit Match Bonus from £20 to £200: Min 50x wagering (% game weightings apply), play restrictions apply. Max bonus bet of £5, 15 days to accept & 30 days to complete wagering. Deposited funds locked to casino platform until wagering met. Your own deposited funds can be withdrawn at any time. Real money funds used first. Free Spins: Available after deposit bonus is redeemed/lost, credited as £2 bonus. Dream Catcher only. 1x wagering and Max bonus bet of £5 applies to winnings, 7 days to accept & 7 days to complete wagering, maximum withdrawal from winnings is £200. Bonus funds used first. See Full T&C’s. The Genting Casino brand has long been a leading traditional casino operator, with an impressive 42 venues across the UK. But these days the fun doesn't stop once you're home, all thanks to the online Genting Casino! EXCLUSIVE: Up to 10% Cashback + £500 Welcome Package! If you're looking for experience, fresh content and innovation, then Mansion Casino is the place to be. As one of the longest serving online casinos in the business, Mansion surely knows how to keep their players happy! 100% First Deposit Bonus up to £200 + £10 Extra Cash + 11 No Wager Spins! On an almost unbelievable day back in September 1996, Frankie Dettori did the unthinkable and rode all seven winners on the race card at Ascot. His incredible feat caused horse racing fans to cry with jubilation – and bookies to just cry. This online slots game powered by Playtech celebrates Dettori's amazing feat while attempting to give players a taste of the equine-induced euphoria the sport of kings is so famed for. 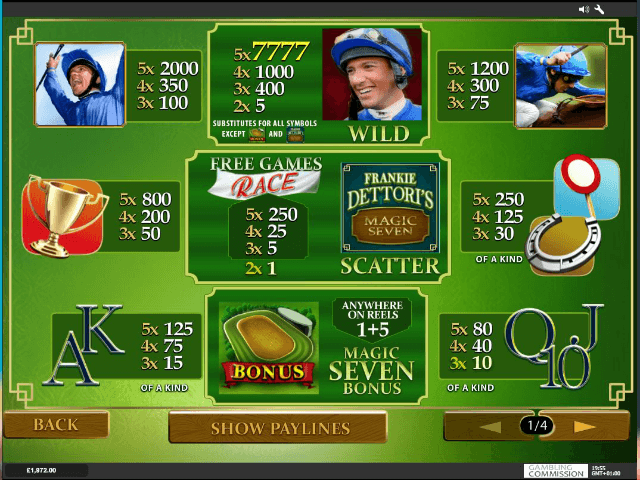 In addition to letting you decide how many lines you want in play (from one to all 25), the Frankie Dettori's Magic Seven slot machine allows you to choose your coin size and select your wager amount per line (from one to ten coins). Thus, your final bet will actually be all three of these variables multiplied together. In mathematical terms this means you can play from as little as 25p a spin to as much as £125 a spin. Payouts start from ten-times and increase all the way up to a whip-cracking jackpot of 7,777 times. Land three or more scatters and you’ll trigger the Free Games Race. This entails being taken to a new screen showing three horses about to race. Choose one of the horses then watch (and cheer) as it speeds around the track competing with the other two. If your chosen neddy romps home first then you’ll win 35 free spins. Second will get you 15, while third awards ten. It’s worth noting the free games proffer more wilds and scatters, thereby encouraging greater returns. The second bonus round is activated when the Racetrack symbols pop up on the first and fifth reels. 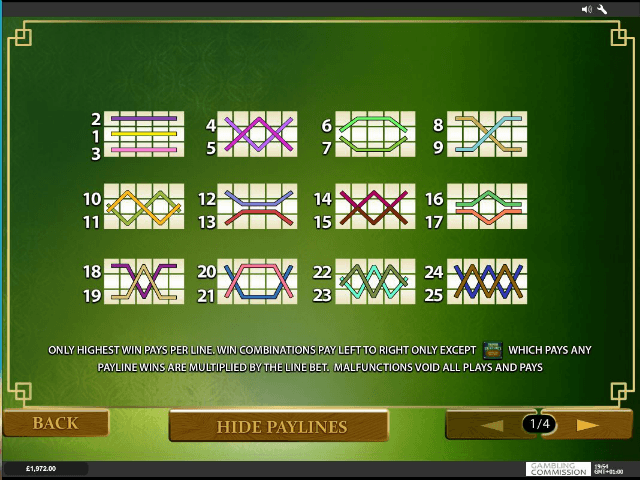 When this occurs you enter the Magic Seven Bonus, another race-themed feature where you select portions of the track one at a time to reveal instant cash prizes and multiplier boosts while watching Frankie Dettori's historic wins. This round ends when you display the Collect icon. Whilst Frankie Dettori's Magic Seven is unlikely to win any prizes in the presentation stakes, there’s no denying its bonus features provide plenty of excitement and rewards. Well worth a punt. Share this Frankie Dettori's Magic Seven Review today! 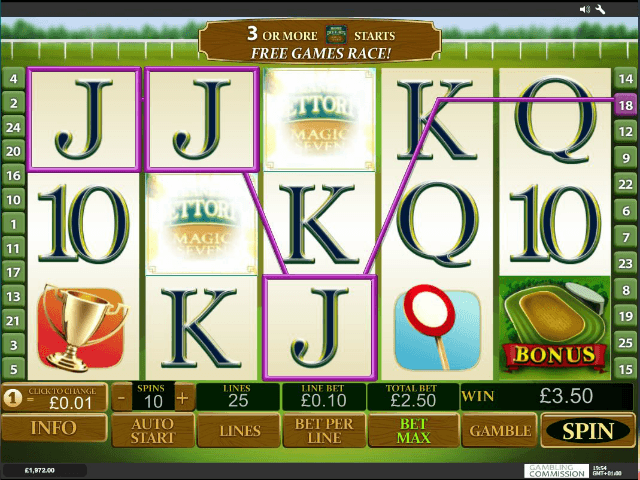 If you like Frankie Dettori's Magic Seven, you'll love these slot titles too!